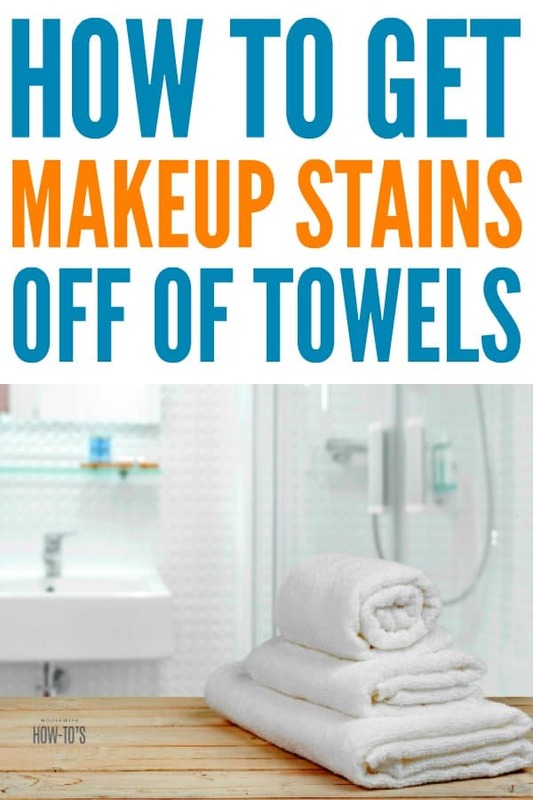 Need to know how to get makeup stains off of towels? It’s something that drove me crazy for ages, and I can’t say my daughter was entirely the one to blame. Sometimes, despite careful washing, I wind up with makeup stains on my towels, too. For a while, I was so frustrated that I considered switching to dark bath linens. 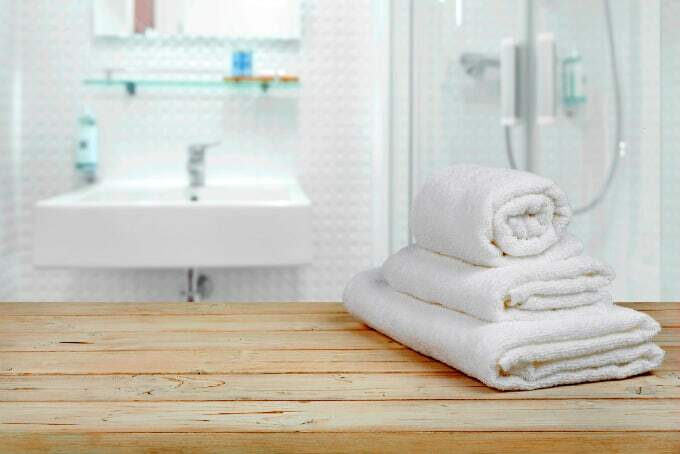 I love the look of fluffy white bath linens, though, so I decided I needed to learn how to get makeup stains off of towels rather than replace mine. Of course, removing makeup properly will go a long way to preventing stains on towels. I’ve found that using a homemade makeup remover wipe before I wash my face is the best way to keep stains away, but sometimes I forget or do a poor job. That’s when these steps help. 1. Don’t delay. If treated right away, mascara stains usually come out with a dab of liquid dish detergent, some vigorous rubbing, and a warm water rinse. The liquid dish detergent works better than soap because it’s specifically designed to cut grease. Mascara is made of oils, waxes, and dyes — all of which dish detergent is created to dissolve. 2. Soak set-in stains. If the stain has been there for a while, soak it overnight in a bowl filled with 2 cups warm water, 1 tablespoon liquid dish detergent, and 2 tablespoons Oxiclean. Wring the cloth out and rinse it well under warm water, then inspect it for any remaining stain before laundering. 1. Use shaving cream. Shaving foam (not the gel kind) does a brilliant job of removing oil-free liquid foundation from towels. Spray it on both sides, rub it in well, and rinse under warm water. Repeat this process as needed until the stain is gone. 2. Soak overnight. Oil-based liquid foundation or foundation powders require a different approach. For these stains, make a strong soaking solution by combining 2 quarts hot water, 1 cup baking soda, and 1/4 cup liquid laundry detergent. Let the stained fabric soak overnight then wring and rinse it thoroughly. Launder in the hottest setting and add 1/2 cup bleach (or Oxiclean, but not both) to the wash cycle. Make sure the stain is gone before drying and repeat steps if needed. I’m not going to lie: lipstick stains are the worst. Like mascara, lipstick is a combination of substances. In this case, it’s color-intensive pigments, oils, and waxes specifically created to stay put. To get lipstick stains out, you need to treat all three substances. 1. Dissolve the pigments. Stack three white paper towels on your counter and put the stained fabric on top. Dip the corner of another paper towel in rubbing alcohol (surgical spirits in the UK) and then, dabbing but NOT rubbing, carefully blot the stain. Rotate the moistened paper towel, so you’re continually working with a clean area. Continue until the lipstick stain begins to fade. 2. Cut through the oils and waxes. Once the pigments have started to lift away, squirt a grease-cutting liquid dish detergent right on top of the remaining rubbing alcohol. Gently spread it with your finger but do NOT rub it in. Allow the cleanser 15-20 minutes to work, then hold the fabric stained side down under a stream of hot running water to remove any remaining residue. 3. Repeat if needed before laundering. Continue to repeat steps 1 and 2 until the stain is completely gone. Launder the fabric immediately, and add Oxyclean or bleach (not both) to the wash cycle along with your laundry detergent. Although these steps have helped me get makeup stains off of towels and washcloths 99% of the time, there’s always the occasional stubborn stain. Usually, it’s one I didn’t find before laundering, and the dryer made the stain almost permanent. When that happens, I give these last-ditch steps a try. • Goo Gone. The same Goo Gone you’d use to remove sticky price tags or tree sap can often get out stubborn makeup stains on towels. Since it can be a skin irritant, I try not to use it unless all other measures have failed. • Acetone-based nail polish remover. Acetone is another substance that can irritate and sometimes leaves behind an odor unless you wash the fabric repeatedly. That said, it worked when nothing else removed the stains from a 24-hour lipstick I used to wear. • Ammonia. If you’ve ever used household ammonia, then you know why this is the very last step I try. Before using ammonia, be sure you’ve thoroughly laundered (but not dried) the stained towel to remove residue from all other stain-removing efforts. Next, combine 1 quart hot water, 1 tablespoon ammonia, and 1/2 teaspoon bleach-free liquid laundry detergent. Soak the stain in this for 20 minutes, scrub with an old toothbrush, rinse, and launder.